The new Siam Country Club in Pattaya, a par-72 that will play at 6,469 yards, will be showcased during the Honda LPGA Thailand, October 25-28.This will be the first professional golf tournament held at the Siam Country Club, Pattaya after renovations were completed in 2007. Siam Country Club, Pattaya, one of the best golf courses in Thailand, has been opened for more than 35 years and is the oldest golf course in Pattaya. It is situated among breathtaking views on an 800 rai land pl only 15 minutes from Pattaya Beach, Thailand.Major renovations to the course and clubhouse were completed in May. The original layout has been preserved, but modifications were made from tees to greens to be ready to host international tournaments. The course was bulldozed and rebuilt from tee to green and edge to edge. 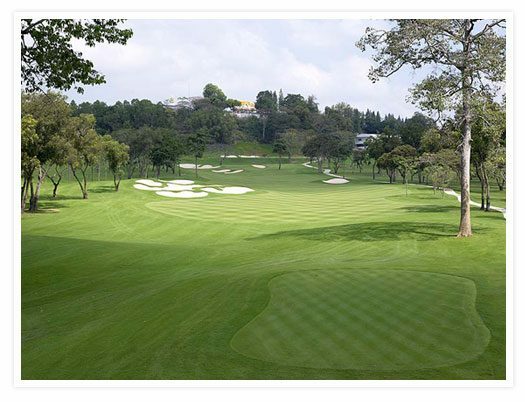 This involved construction of new greens and bunkers, installation of new turf, expansion of water hazards to bring them more into play and gain more water storage, removal of 20-30 percent of the course’s trees to allow for better air flow around greens and to reclaim playing corridors, and repaving of all cart paths. Eighteen completely new greens were built using Novatek Ultra Dwarf Bermuda Grass. In addition to replacing the greens every bunker was re-sculpted and high-flashed sand applied on all bunker faces. All turf was replaced with the salt and brackish water tolerant Seashore Paspalum, a revolutionary strand typically used in tropical and subtropical climates in coastal areas. The clubhouse has been upgraded to a modern look that offers a cozy and relaxed atmosphere to view all 18 holes. The Honda LPGA Thailand a four-day tournament with no cut and features a field comprised of the Top-50 on the money list plus 10 sponsor’s exemptions. Annika Sorenstam, Paula Creamer, Morgan Pressel, and Ai Miyazato are among those who have already committed to play in the US$1,300,000 event. If you are in Thailand next week, why not take in the tournament on one of Thailand’s newest golf courses, also one of the best golf courses in Pattaya, even rivaling Laem Chabang for top honors. The Honda LPGA Thailand 2007 is one of three LPGA-sanctioned events in Asia, and it’s an integral part of Asian events on LPGA calendar and probably Thailand’s greatest ladies’ golf tournament ever held. Building on the success of last year’s Honda LPGA Thailand, Honda will host the event for the second year. The golf tournament is a good opportunity for golfers in Thailand to observe the technique of some of the world’s lady golf professionals. This is an excellent chance for Thai golfers to watch world class players. If you would like any more information on this tournament or a Pattaya golf package including golf at Siam Country Club please at my at my Thailand golf vacation and I will be glad to suggest something.